So, which strawberry variety is right for you, your needs, your location? Of course, it depends on several factors. This page is designed to help you consider all your options and pick one or more strawberry varieties that will perform well for you. If you have already settled on a variety, compare prices for your chosen cultivar at the Buy Strawberry Plants page. You can also find a directory of plant suppliers at our Strawberry Plants for Sale page. Or, you can find strawberry seed suppliers at our Strawberry Seeds page. Whichever strawberry varieties you select, be sure to reference the Growing Strawberries page for help maximizing your strawberry yield! This main Strawberry Varieties page serves as a hub for everything related to individual strawberry varieties. 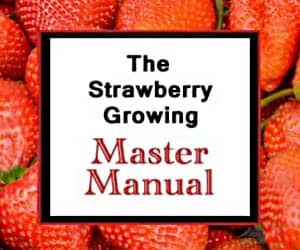 The heart of this page is the List of Strawberry Varieties / Cultivars below. You can sort it according to each of the categories to better find exactly which strawberry variety will work best for you and your strawberry growing desires. Prior to the List of Strawberry Varieties / Cultivars table, a brief explanation of the three strawberry types will provide some background information as you select which strawberry type and variety is right for you. If you have no idea which strawberry variety (or varieties) is appropriate for your location, the list of recommended strawberry cultivars for each state will help guide you. New strawberry varieties are constantly being bred and released. So, the links at the bottom of this page will be updated regularly with new information and links. And, feel free to use the comments or the form on the About page to contact us with questions or remarks. Prior to browsing our table of strawberry varieties, it is important to review the three types of strawberries. Strawberry plants can be either June-bearing (June bearing), everbearing (ever-bearing), or day-neutral (day neutral). Any list of strawberry varieties will probably contain more June-bearing strawberry varieties than any other. June bearers are tremendously popular and common. They typically produce the largest strawberries, and do so over a period of two to three weeks, on average. Most June bearing strawberry varieties produce a harvest around the month of June, hence the name. However, strawberry varieties are further classified into Early Season, Midseason, and Late Season. By selecting strawberry plant varieties that produce during different parts of the season, you can prolong your harvest and enjoy fresh strawberries for an extended period of time. June bearing strawberries are most often of the Garden Strawberry variety (Fragaria x ananassa). June bearing strawberries are often planted using the matted row system. For reference, each of the June bearing strawberry types generally sets fruit for a total of 10 to 14 days. Early Season strawberry varieties usually begin fruiting in late spring. Early Midseason strawberry varieties begin fruiting about 5 days after Early Season varieties. Midseason strawberry varieties begin producing approximately 8 days after Early Season varieties. Late Midseason strawberry varieties begin fruiting about 10 days after Early Season varieties, and Late Season strawberry varieties begin their berry production about 14 days after the Early Season varieties. Everbearing strawberries aren’t really “everbearing.” They generally produce two harvests per year: one in the spring and another in the late summer or fall. Under ideal conditions, it is possible for some everbearing varieties to produce three berry harvests. Most everbearing strawberry types are also Fragaria x ananassa hybrids, but some are of the species Fragaria vesca. In general, everbearing varieties put out less runners than the June bearing varieties, as most of the plants productive energy is directed toward producing multiple strawberry harvests. Everbearing strawberries are often planted using the hill system or in locations where space is limited. Day neutral strawberry plants are unique. Unlike June bearing varieties, day neutral strawberries will produce a good yield in the first year they are planted. They flower and set strawberries whenever the temperature is between 35 and 85 degrees. They will still be producing fruit in October during milder years. The drawback to day neutral strawberry plants is that they produce smaller strawberries than do the June bearing and everbearing strawberry varieties. Their fruit is usually small to medium in size, rarely exceeding one inch. Day neutral strawberry varieties are often planted using the hill system or in locations where space is limited. There are hundreds of different strawberry cultivars. Each one performs differently depending on the climate and conditions in which it is grown. To maximize strawberry production, it is important to choose a variety that is well-suited to your growing region. If you don’t already know which specific strawberry cultivars are a good choice for your state, you can find out by viewing the Recommended Strawberry Varieties by State (U.S.A.) or by viewing the Recommended Strawberry Varieties by Province or Territory (Canada). The following table is interactive. Click the column title at the top to rearrange and sort the entries according to the contents of that column. New varieties will be added on an on-going basis as they are discovered or brought to our attention. Ac Valley Sunset Fragaria × ananassa Late Season Andrew Jamieson in Kentville, Nova Scotia Plant shows good vigor with no apparent foliage disease concerns. Fragaria × ananassa Early Season Kentville Research Station in Nova Scotia An Evangeline cross Moderately resistant to powdery mildew and red stele, but susceptible to verticillium wilt. Frost damage potential, very early flowering. Alba Fragaria × ananassa Early Season New Fruits s.a.s., Italy 2002 Resistant to most common root diseases, tolerant to mildew (Oidium fragariae) and Xanthomonas fragariae, susceptible to Colletotrichum acutatum. Resistant to verticillium wilt, Phytophthora crown rot, and relatively resistant to anthracnose crown rot. Alexandria Fragaria vesca Everbearing George W. Park Seed Co, USA 1964 Runnerless, must be seed-propagated. Allstar Fragaria × ananassa Midseason USDA / Univ. of Maryland 1981 US 4419 × MDVS 3184 This widely adapted variety has performed consistently well from the East to central Midwest. It is highly resistant to red stele, with intermediate resistance to Verticillium wilt. Very popular in Michigan. Alpine Strawberry Fragaria vesca Everbearing Native to Northern Hemisphere Also known as the woodland strawberry, fraises des bois, wild strawberry, European strawberry. The Fragaria alpina species is now considered the same as Fragaria vesca. Amelia Fragaria × ananassa Late Season East Malling Research, UK 1998 Includes Pandora, Marmolada, Kent, and Providence Splitting below the calyx has been noted in some trials. Moderate resistance to powdery mildew (Sphaerotheca macularis) and crown rot (Phytophthora cactorum). Anitabis Fragaria × ananassa Very Early Season Magnani & Molari, Italy Tolerant to most common root diseases and grows well in non-sterilized soil. Moderately tolerant to mildew (Oidium fragariae) and has a low susceptibility to Colletotrichum acutatum. Annapolis Fragaria × ananassa Early Season AAFC (Agriculture and Agri-Food Canada) 1984 (Micmac × Raritan) × Earliglow A vigorous and winter-hardy variety, Annapolis has resistance to red stele. Annelie Fragaria × vescana Swedish breeding program at Balsgård 1977 A mutant parent plant was created to allow a non-sterile hybrid to be created between two species that would normally not cross. Arapahoe Fragaria × ananassa Everbearing USDA, Cheyenne 1954 Extremely hardy variety even into Canada. Not available commercially. Asia Fragaria × ananassa Early Midseason New Friuts s.a.s., Italy 2005 Tolerant to most common root diseases, susceptible to mildew (Oidium fragariae) and Colletotrichum acutatum. Frost resistant. Avalon Fragaria × ananassa Early Season Rutgers University Good flavor and berry firmness. Large, vigorous plants. Baron Solemacher Fragaria vesca Everbearing F. C. Heinemann, Germany 1935 Runnerless, must be seed-propagated. Beach Strawberry Fragaria chiloensis This strawberry species goes by several names: beach strawberry, Chilean strawberry, coastal strawberry. Benicia Fragaria × ananassa Short-day June-bearing University of California, Strawberry Improvement Program 2010 See profile of this strawberry variety by clicking its name in the far left column. Bish Fragaria × ananassa Jim Ballington of North Carolina State University 2002 This cultivar was developed for use in plasticulture systems and has good disease resistance. It is especially well suited to the upper Piedmont and Mountain regions of North Carolina. Blakemore Fragaria × ananassa USDA, Glenn Dale, MD 1930 Tart berries best used for jams and jellies. Produces lots of runners. Blanc Amélioré Fragaria vesca Everbearing Developed in Great Britain White strawberries. Doubtful that clone in existance today is identical to the historical variety. Sometimes has enormous berries of the Fressant type. Bolero Fragaria × ananassa Everbearing East Malling Research, UK 1996 Includes Redgauntlet, Wiltguard, Gorella, Cardinal, and Selva Moderately resistant to powdery mildew. Some resistance to crown rot (Phytophthora cactorum) and wilt (Verticillium dahliae). Brunswick Fragaria × ananassa Early Midseason USDA / Kentville Research Center, Kentville, Nova Scotia, Canada 1999 Cavendish × 'Honeoye' Resistant to red stele. Susceptible to Phytophthora crown rot. Likely sensitive to Sinbar. Good for home gardens. Good for northern locations. Cabot Fragaria × ananassa Midseason AAFC (Agriculture and Agri-Food Canada) 1998 ('Elsanta' × K79-5) × (ArKing × K7-40) Known for its huge berries, excellent flavor, winter hardiness and disease resistance. Best suited for northern locations and home gardens. Susceptible to Botrytis and crown rot. Calypso Fragaria × ananassa Everbearing East Malling Research, UK 1991 Rapella × Selva One of the everbearing strawberry varieties that produces significant runners. Moderately resistant to wilt (Verticillium dahliae). It is susceptible to powdery mildew (Sphaerotheca macularis). Canoga Fragaria × ananassa Late Midseason Cornell Small Fruits Breeding Program NY1123 (‘Senga Sengana’ x ‘Midland’) x Holiday (1979) Good for plasticulture. Capron Fragaria moschata Quintinye (the gardener to Louis XIV) 1672 Also known as Le Chapiron, Chapiton, Capiton. Cardinal Fragaria × ananassa Midseason AAES (Arkansas Agricultural Experiment Station) Good for Pick-Your-Own operations. Most common commercial strawberry cultivar in Oklahoma. Cassandra Fragaria × ananassa Midseason East Malling Research, UK 1998 Includes Rosie, Eros, Rapella, and Selva Good runner production. Moderately resistant to powdery mildew (Podosphaera aphanis) but susceptible to wilt (Verticillium dahliae) and crown rot (Phytophthora cactorum). Cavendish Fragaria × ananassa Midseason AAFC (Agriculture and Agri-Food Canada) 1990 Glooscap × Annapolis Highly resistant to red stele and has some resistance to Verticillium wilt. Chandler Fragaria × ananassa Midseason Well-suited for southern planting. A Californian variety that is adaptable to the eastern U.S. Susceptible to anthracnose disease. Chilean Strawberry Fragaria chiloensis This strawberry species goes by several names: beach strawberry, Chilean strawberry, coastal strawberry. Christine Fragaria × ananassa Dr. Derek Jennings 2002 Highly resistant to Verticillium wilt (Verticillium dahliae) and powdery mildew (Podosphaera aphanis). Susceptible to crown rot (Phythophthora cactorum). Clancy Fragaria × ananassa Late Midseason Dr. Courtney Weber of the Cornell Breeding Program in Geneva, NY (Cornell / NYSAES) 2003 MDUS4774 × MDUS5199 Plants fruit late, resistant to red stele. Fragaria chiloensis This strawberry species goes by several names: beach strawberry, Chilean strawberry, coastal strawberry. Daroyal Fragaria × ananassa Darbonne-Inotalis breeding program in France. Plants have strong rooting capacity. Darselect Fragaria × ananassa Early Midseason Darbonne, France 1998 Parker × 'Elsanta' Widely adapted variety for plasticulture or matted-row production. Very sesceptible to leaf scorch and powdery mildew. Signed non-propagation agreement may be required before shipment due to patent laws. Delia Fragaria × ananassa Early Midseason East Malling Research, UK 2007 'Honeoye' × ITA 80-51-1 Delia does not have strong resistance to any of the common strawberry diseases. A spray program with soil sterilization may be needed. Earliglow Fragaria × ananassa Early Season USDA, Beltsville 1975 (Fairland × Midland) × (Redglow × Surecrop) A good variety for beginners. Good resistance to red stele and intermediate resistance to Verticillium wilt. Elegance Fragaria × ananassa Late Season East Malling Research, UK 2009 EM834 × EM1033 Moderately resistant to crown rot (Phytophthora cactorum) and Verticillium wilt (Verticillium dahliae). Susceptible to powdery mildew (Sphaerotheca macularis). Emily Fragaria × ananassa Early Season East Malling Research, UK 1995 'Honeoye' × Gea Resistant to powdery mildew (Sphaerotheca macularis) although susceptible to wilt (Verticillium dahliae). Eros Fragaria × ananassa Midseason East Malling Research, U.K. 1985 Allstar × 'Elsanta' Performs well in plasticulture and in the matted-row system. Resistant to red stele, and tolerant of leaf diseases. European Strawberry Fragaria vesca Everbearing Native to Northern Hemisphere Also known as the woodland strawberry, fraises des bois, wild strawberry, alpine strawberry. Evangeline Fragaria × ananassa Early Season AAFC (Agriculture and Agri-Food Canada) 1975 (Honeoye × Veestar) × NYUS119 Tolerant to leaf diseases. Susceptible to red stele. Evie 2 Fragaria × ananassa Day-Neutral Edward Vinson Ltd. (U.K.) 2006 Everglade × J92D12 Less sensitive to warm summer temperatures. Produces one of the highest yeilds of the day-neutral strawberry varieties. Fragaria × ananassa Everbearing East Malling Research, UK 2002 Evita × EMR77 (EMR77 involves Selva, Tioga, Gorella, and Gento) Susceptible to powdery mildew (Sphaerotheca macularis). Flavorfest Fragaria × ananassa Midseason USDA, Beltsville 2012 B759 x B786 Click on link at beginning of row for details. Florence Fragaria × ananassa Late Midseason East Malling Research, UK 1997 [Tioga x ('Redgauntlet' × (Wiltguard × Gorella))] × (Providence × self) Moderately resistant to powdery mildew and other fungal leaf diseases. The variety has also shown tolerance to vine weevil (Otiorhynchus sulcatas) and has good resistance to wilt (Verticillium dahliae) and crown rot (Phytophthora cactorum). Florika Fragaria × vescana German breeding program 1989 ('Sparkle' × F. vesca 'Semperflorens') × 'Klettererdebeere H.' A mutant parent plant was created to allow a non-sterile hybrid to be created between two species that would normally not cross. Fragaria daltoniana Fragaria daltoniana Native to the Himalayas Fragaria daltoniana berries are of poor flavor. There is no commercial value for this species. Fragaria glauca Fragaria glauca Native to North America Fragaria glauca is also referred to as a subspecies of Fragaria virginiana. These wild-type strawberry plants are found in the wild in Alaska and other northern locations. Fragaria nilgerrensis Fragaria nilgerrensis Native to southern and southeast Asia Fragaria nilgerrensis berries are of poor flavor. There is no commercial value for this species. Fragaria nipponica yakusimensis Fragaria nipponica yakusimensis Native to the Japanese island of Yakushima Cultivated in Japan for its fruit. Fragaria nubicola Fragaria nubicola Native to the Himalayas Fragaria nubicola is of no commercial value. Fragaria viridis Fragaria viridis Native to Europe and central Asia Very small berries. Fragaria yezoensis Fragaria yezoensis Native to the eastern side of the Japanese island of Hokkaidō, the Kuril Islands, and Sakhalin in Russia Fragaria yezoensis is of no economic value. Frel (Pink Panda) Fragaria × Comarum Fragaria × Comarum hybrid involving Fragaria chiloensis Pink flowers; few fruit. Galletta Fragaria × ananassa Early Season Jim Ballington at North Carolina State University 2006 One of the strawberry varieties well-suited to both home and commercial growers. It is especially well suited to the upper Piedmont and Mountain regions of North Carolina. Gartenfreude Fragaria vesca Everbearing Developed in Germany Produces large strawberries, sometimes of the Fressant type. Gemma Fragaria × ananassa Midseason New Fruits s.a.s., Italy Resistant to the most common diseases. Glooscap Fragaria × ananassa Early Midseason AAFC (Agriculture and Agri-Food Canada) 1983 Mic Mac × Bounty Susceptible to red stele. June yellows has been observed. Tolerant to Sinbar. Golden Alexandria Fragaria vesca Everbearing Runnerless, must be seed-propagated. Governor Simcoe Fragaria × ananassa Late Midseason HRIO 1985 Guardian × Holiday Susceptible to powdery mildew and leaf blight. Hecker Fragaria × ananassa Early Season Honeyoye × (Vibrant × Holiday) Purchase plant here. Honeoye Fragaria × ananassa Early Midseason Cornell / NYSAES 1979 Vibrant × Holiday One of the top strawberry varieties for over 20 years. Vigorous plants with no soil-disease resistance. Idea Fragaria × ananassa Very Late Season The Italian breeding program in Cesena, Italy Has red stele resistance and anthracnose tolerance. Illa Martin Fragaria vesca Everbearing Developed in Germany Produces white strawberries with red "seeds" (achenes). Irresistable Fragaria × ananassa East Malling Research, UK 2001 Includes strawberry varieties Rosie, Eros, Rapella, and Selva Moderately resistant to crown rot (Phytophthora cactorum) but susceptible to wilt (Verticillium dahliae) and powdery mildew (Podosphaera aphanis). Itasca Fragaria × ananassa Early Midseason USDA / Univ. of Minnesota 2005 Allstar × Seneca Resistant to leaf diseases and red stele. May have an unpleasant aftertaste. Iturup Strawberry Fragaria iturupensis Native to Iturup of the Kuril Islands, Japan Has relatively large berries for a wild-type species. Jewel Fragaria × ananassa Late Midseason Cornell / NYSAES 1985 ('Senga Sengana' × NYE58) × Holiday Plants have moderate winter hardiness. Care must be taken at renovation to maintain a good plant stand. Sensitive to Sinbar. Susceptible to leaf spot, red stele, powdery mildew, black root rot, and Verticillium. Judibell Fragaria × ananassa Very Late Season East Malling Research, UK 2005 Includes Pandora and Elsanta as grandparents Good resistance to wilt (Verticillium dahliae) and crown rot (Phytophthora cactorum). Partial resistance to powdery mildew (Sphaerotheca macularis) and black spot (Colletotrichum acutatum). Kalinda Fragaria × ananassa Department of Primary Industries - Knoxfield, Victoria, Australia 1997 92-050-76 x Lowanna (1997) Plants have a moderate chilling requirement. No particular susceptibility to pests. Strong resistance to powdery mildew. Kent Fragaria × ananassa Midseason AAFC (Agriculture and Agri-Food Canada) 1981 ('Redgauntlet' × Tioga) × Raritan Produces multi-crowned plants with few runners in hot conditions. Very susceptible to leaf spot, leaf scorch, angular leaf spot, Botrytis, Sinbar, and anthracnose fruit rot. Kiewa Fragaria × ananassa Department of Primary Industries - Knoxfield, Victoria, Australia Tallara x Chandler No particular susceptibility to pests, leaf, or fruit diseases. Lambada Fragaria × ananassa Plant Research International B.V. 1982 (Sivetta x Holiday) x (Karina x Primella) Good resistance to Verticillium Wilt, Crown Rot and Grey Mold. Slightly prone to Mildew and Alternaria Leaf Spot and somewhat susceptible to Red Core. L'Amour Fragaria × ananassa Midseason Cornell / NYSAES (NY State Experiment Station) 2003 (MDUS5252 × Etna) × Cavendish Long, round conic shape with a fancy calyx makes them very attractive. Susceptible to angular leaf spot. Lipstick Fragaria × Comarum (Fragaria x ananassa) x Comarum palustre [hybrid involving Fragaria chiloensis] Grown for ornamental reasons. Little Scarlet Fragaria virginiana C.J. Wilkin Brought to Britain from America by C.J. Wilkin. Lucy Fragaria × ananassa Late Midseason East Malling Research, UK 2009 Includes Honeoye, Selva, and Rapella Some resistance to crown rot (Phytophthora cactorum). Moderately susceptible to both verticillium wilt (Verticillium dahliae) and powdery mildew (Podosphaera aphanis). Mae Fragaria × ananassa Early Midseason East Malling Research, UK 2003 Rosie × Marmolada No strong resistance to any of the common strawberry diseases. Consider a spray program and soil sterilization. Malwina Fragaria × ananassa Peter and Joseph Stoppel, Germany Tolerant to verticillium wilt. Mara Des Bois Fragaria × ananassa Developed by a French breeding program Small to medium fruits contain the highest flavor and aroma of all strawberry varieties. Matis Fragaria × ananassa Midseason Jacques Marionnet GFA, France 2003 Mara Des Bois x Marrionnet hybrid Can produce over 1kg of strawberries per plant. Mesabi Fragaria × ananassa Midseason University of Minnesota-USDA Cooperative Breeding program Highly resistant to red stele with good resistance to leaf diseases. A good choice for northern locations, especially in the northern Midwest. Suited for organic growing. Millewa Fragaria × ananassa Department of Primary Industries - Knoxfield, Victoria, Australia 1992 Chandler x Adina No particular susceptibility to pests. Strong resistance to powdery mildew. Plants have a moderate chilling requirement, which must be met for satisfactory plant growth. Mira Fragaria × ananassa Midseason AAFC (Agriculture and Agri-Food Canada) 1996 Scott × 'Honeoye' Flavor may be tart. Berry texture becomes mealy under hot conditions. Mojave Fragaria × ananassa Short-day June-bearing University of California, Strawberry Improvement Program 2010 See profile of this strawberry variety by clicking its name in the far left column. Monophylla Fragaria vesca Everbearing Duchesne 1885 Also known as the Strawberry of Versailles. This variety is considered an oddity and has one large leaflet instead of the normal three. Multiplex Fragaria vesca Everbearing This variety is considered an oddity. It is double-flowered, but sets less and smaller fruit. Muricata Fragaria vesca Everbearing Also known as the Plymouth strawberry. Flowers are composed of numerous small, leafy bracts, and the fruit are similarly spiky. Musk Strawberry Fragaria moschata Native to Europe Also known as the Hautbois Strawberry or Hautboy Strawberry. Northeaster Fragaria × ananassa Early Season USDA, Beltsville 1994 High disease resistance. Northeastern Fragaria × ananassa Early Season USDA 1994 Mdus 4380 × Holiday Resistant to the 5 eastern races of red stele, susceptible to powdery mildew. Ogallala Fragaria × ananassa Everbearing USDA, Cheyenne 1956 Extremely hardy variety, even into Canada. Ovation Fragaria × ananassa Late Season USDA, Beltsville, MD breeding program Resistant to five strains of red stele and shows good tolerance to foliage diseases. Especially suited for plasticulture. Ozark Beauty Fragaria × ananassa Everbearing J.B. Winn, Arkansas 1955 Red Rich x Twentieth Century Probably the best everbearing strawberry variety for Arkansas. Mother plants produce runners and fruit well, but runner plants usually will not produce any strawberries during their first year, unlike most others. Pandora Fragaria × ananassa Late Season East Malling Research, UK 1988 (Von Humboldt × Redstar) × 'Merton Dawn' Moderately resistant to wilt (Verticillium dahliae), crown rot (Phytophthora cactorum), blackspot Colletotrichum acutatum, and powdery mildew (Sphaerotheca macularis). Susceptible to red core (Phytophthora fragariae), angular leaf spot (Xanthomonas fragariae), and (Diplocarpon earliana). Pavana Fragaria × ananassa Late Season Plant Research International B.V. Pink Panda ('Frel') Fragaria × Comarum Fragaria × Comarum hybrid involving Fragaria chiloensis Pink flowers, few fruit. Quarantaine de Prin Fragaria vesca Everbearing Developed in France Almost extinct. May be identical to the variety ‘Erigée de Poitou’. Quinault Fragaria × ananassa Everbearing Will produce strawberries on unrooted runners. R14 Fragaria × ananassa Very Late Season University of Guelph, Simcoe, Ontario 2007 Sister to Serenity, with better fruit quality but lower yields. Rebecka Fragaria × ananassa Swedish breeding program at Balsgård 1998 ('Fern' × F. vesca 4×) × F. × ananassa F861502 A mutant parent plant was created to allow a non-sterile hybrid to be created between two species that would normally not cross. Record Fragaria × ananassa Very Late Season Dr. Walther Faedi, at the Instituto Sperimentale per la Fruitticoltura, Forli, Italy An 'Idea' hybrid A very vigorous plant with no apparent foliage issues. Red Ruby ('Samba') Fragaria × Comarum Fragaria × Comarum hybrid involving Fragaria chiloensis Red flowers, few fruit. Roxana Fragaria × ananassa Late Season New Fruits s.a.s., Italy 2001 Very resistant to most common root diseases, tolerant to powdery mildew (Oidium fragariae) and Xanthomonas fragariae, quite susceptible to Colletotrichum acutatum. Rügen Fragaria vesca Everbearing Emil Spangenberg from Morsleben 1920 Runnerless, must be seed-propagated. Originated from Castle Putbus in Germany. Sable Fragaria × ananassa Early Season AAFC, Kentville N.S. 1998 Veestar × Cavendish Good winter hardiness. Resistant to red stele. Susceptible to angular leaf spot and Botrytis. Samba (Red Ruby) Fragaria × Comarum Fragaria × Comarum hybrid involving Fragaria chiloensis Red flowers, few fruit. Sapphire Fragaria × ananassa Midseason University of Guelph, Simcoe, Ontario 2002 319A92 × V7737-2 Low yield. Susceptible to Botrytis, otherwise, disease tolerance unknown. Sara Fragaria × vescana Swedish breeding program at Balsgård 1988 'Annelie' × [('Sparkle' × F. vesca 4×) open pollinated] A mutant parent plant was created to allow a non-sterile hybrid to be created between two species that would normally not cross. Sasha Fragaria × ananassa East Malling Research, UK 1999 EM881 x Eros Susceptible to wilt (Verticillium dahliae) and powdery mildew (Podosphaera aphanis). Seascape Fragaria × ananassa Day-Neutral University of California 1991 Peak production in August and early September. Highly successful for north eastern growers for summer and fall production. Selva Fragaria × ananassa Day-Neutral One of the strawberry varieties most widely planted in California and Florida. Produces very large strawberries. Seneca Fragaria × ananassa Midseason Cornell University small fruits breeding program in Geneva, N.Y. 1991 NY1261 × Holiday Performs well in the matted row system, excels in plasticulture. Serenity Fragaria × ananassa Late Season University of Guelph, Simcoe, Ontario 2003 137A84 x Chandler Susceptible to anthracnose fruit rot. Sonata Fragaria × ananassa Midseason Fresh Forward, Wageningen, The Netherlands (Selected by Bert Meulenbroek) 1998 Able to stand very hot spells and periods of heavy rain. Spadeka Fragaria × vescana German breeding program 1977 A mutant parent plant was created to allow a non-sterile hybrid to be created between two species that would normally not cross. Sparkle Fragaria × ananassa Late Season 1949 Fairfax x Aberdeon One of the heirloom strawberry varieties. Excellent choice for home gardeners and pick-your-own operations in northern climates. St. Pierre Fragaria × ananassa Very Late Season AAFC, St. Jean-sur-Richelieu, Qué 2002 Chandler x Jewel Susceptible to anthracnose fruit rot and powdery mildew. Sweet Charlie Fragaria × ananassa Early Season University of Florida, Gulf Coast Research and Education Center FL 80-456 x Pajaro Resistant to crown rot, most fruit rot, two-spotted spider mites, powdery mildew. Susceptible to leaf blight. Syria Fragaria × ananassa Midseason New Fruits s.a.s., Italy Tolerant to the most common diseases. V151 Fragaria × ananassa Early Season University of Guelph, Simcoe, Ontario 2007 (FL82-1452 x Selkirk) x (Chandler x 137A84) Very susceptible to anthracnose fruit infections, green petal disease. Flavor occasionally bland. Valley Sunset Fragaria × ananassa Very Late Season AAFC, Kentville, Nova Scotia 2006 Great-grandparents include Pandora, Scotland, Micmac, Allstar, Cavendish and Bogota. Somewhat seedy. Veestar Fragaria × ananassa Early Season HRIO Vineland, Ontario 1967 Valentine × Sparkle Susceptible to red stele. Tolerant to Sinbar. Excellent for jam. Viktoriana Fragaria × ananassa Late Midseason East Malling Research, UK 1998 Includes Eros, Providence, Linn, Selva, and Rapella Good resistance to crown rot (Phytophthora cactorum) and wilt (Verticillium dahliae). Moderately resistant to powdery mildew (Podosphaera aphanis). Virginia Strawberry Fragaria virginiana Native to North America Often called "wild strawberry." Weisse Solemacher Fragaria vesca Everbearing F. C. Heinemann, Germany Runnerless, must be seed-propagated. One of the strawberry varieties that produces white strawberries. Wendy Fragaria × ananassa Early Season AAFC, Kentville, N.S. 2006 (Sable × K91-2) × Evangeline Moderately resistant to powdery mildew. Susceptible to verticillium wilt. Plants do poorly in stressful conditions. Wild Strawberry Fragaria vesca Everbearing Native to Northern Hemisphere Also known as the woodland strawberry, fraises des bois, European strawberry, alpine strawberry. Winona Fragaria × ananassa Late Season USDA, Beltsville / University of Minnesota Breeding Program 1996 Plants are vigorous, resistant to red stele, and have shown tolerance to black root-rot disease. A good choice for difficult growing conditions, northern climates. Woodland Strawberry Fragaria vesca Everbearing Native to Northern Hemisphere Also known as the alpine strawberry, fraises des bois, wild strawberry, European strawberry. If you have a notable (good or bad) experience with any particular strawberry variety, please let us know. Again, as new strawberry varieties are introduced, we will update this table to reflect recent developments. Additionally, links will be added below when new related articles are posted. So, check back often! Fairfax strawberry plants are back! You can now buy Fairfax strawberry plants for the first time in decades. This legendary strawberry variety is back as of fall 2015! Looking for something to spice up your strawberry patch? Try something different this year with one of these novelty strawberries. Novelty strawberry plants, for the win! Find the right strawberry varieties for your province or territory from this comprehensive list of all the recommended strawberry varieties for Canada. Get started growing strawberries today! Released on December 5th, 2012, the newest release from the USDA’s strawberry breeding program is the promising Flavorfest variety. The Flavorfest strawberry variety shows much potential; details on how to order Flavorfest strawberry plants here. Zone 9 strawberries are discussed here. Strawberries in zone nine have unique challenges. So, get the skinny on which varieties are recommended for hotter regions here. The top 10 most popular strawberry varieties in the USA. Looking for a winner? Pick one of the most popular varieties of strawberry plants for success! Learn everything about the types of white strawberries here, including where to buy them. White strawberry varieties are more diverse than you would imagine, and they have some benefits too! Aren’t the days of June some of the longest of the year? What then are short-day june-bearing strawberry plants? Short-day june-bearers are the only popular short-day strawberries. Find more information here. Information about short-day strawberry plants. Find material on short-day strawberry plants and short-day strawberry varieties here. Recommended strawberry varieties by state. Find which strawberry plant variety you should plant in each of the United States. Then check the for sale page for suppliers. A pineberry is a white strawberry with red seeds. Pineberries are known for having a “pineapple strawberry” taste. Find a supplier of pineberry plants here. Learn about this unique berry here! Fragaria iinumae Strawberry Plants are not famous. This strawberry species is native to Japan. Here is a profile of F. iinumae strawberry plants and strawberries. Sweet Charlie strawberry plant & Sweet Charlie strawberries are profiled here. Get details of the Sweet Charlie strawberry cultivar & where to buy Sweet Charlie strawberry plants here. Ozark Beauty strawberry plant & Ozark Beauty strawberries are profiled here. Get details of the Ozark Beauty strawberry cultivar & where to buy Ozark Beauty strawberry plants here. Chandler strawberry plant & Chandler strawberries are profiled here. Get details of the Chandler strawberry cultivar & where to buy Chandler strawberry plants here. Benicia strawberry plants & Mojave strawberry plants are newly-released cultivars profiled here. Find where to buy Benicia strawberries & Mojave strawberries here. Blakemore strawberry plant & Blakemore strawberries information. Get details of the Blakemore strawberry cultivar & where to buy Blakemore strawberry plants here. Cardinal strawberry plant & Cardinal strawberries information. Get details of the Cardinal strawberry cultivar and where to buy Cardinal strawberry plants here. Mountain Strawberries are a unique fruit-bearing plant. If you want to know where to buy Mountain Strawberry plants or just learn about this strawberry variety, click the link. Have you ever heard of such a variety? If yes, do you know where I could purchase the seeds?